Our guide Sean was fabulous. We got to see so much more in a day with him then we would have ever been able to do by ourselves. It was so wonderful walking the streets of Paris with him as he shared so much local knowledge that really enriched our experience. We travelled with our 12 and 15 year old kids and Sean quickly understood our interests and kept everyone engaged all day. Thanks Sean! We had a local guide Matt, who wa great with the whole family and showed us a behind the scenes perspective of Paris, definitely worht the time. I was a little nervous about doing a personalize tour but I am so glad we did. Alex our guide was super nice and so knowledgeable about the city, sites and history. We walked a lot but it was so worth it. I can't imagine seeing Notre Dame without a guide like Alex. Then he directed us to another cathedral which was amazing. The restaurant we went to for lunch was an out of the way non tourist place and the food was amazing. Worth every penny for the tour!. What a great introduction to this beautiful city! Our guide is from Paris and was a fount of knowledge about history, art and culture. In addition he enjoys photography so when he saw my camera he knew exactly where to go for the best photography shots! I totally recommend this tour for first time travelers to Paris. We walked about 3 miles, saw all the things we had discussed in advance via email and saw Paris through the eyes of a local. It really doesn’t get any better than this! 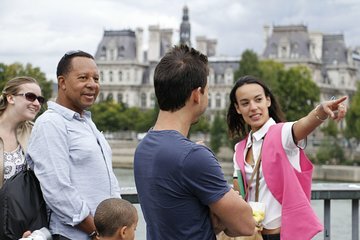 I would recommend this tour to any first time visitor to Paris! Our guide was Florent and he was friendly, accommodating and informative. He took us to key spots in the city in the most efficient way while providing us with the city's rich history, and answering all of our questions. We were able to skip the line at the Louvre, and I wouldn't recommend going there without a guide. It would be easy to get lost and difficult to locate what you are most interested in. Our private tour of Paris was by far our best day! Alex was a wonderful tour guide, personable, knowledgeable, and flexible! He took us to many of the main attractions that we wanted to see, but with the benefit of his wonderful explanations and stories about what we were seeing, it made them so much more meaningful! He also was able to take us off the beaten paths to his favorite creperies, bakeries and back alleys to experience life as a local Parisian! He taught us how to use the metro and gave us tips into what to see and where to eat for the rest of our trip. Excellent tour and definitely the way to go. If you want to experience Paris beyond the crowded tourist attractions, this is the perfect way to do it. Request Alex as your tour guide! Our half-day tour with him was the HIGHLIGHT of our trip to Paris a stay that included two Michelin Star restaurants and hitting many of the highlights on our own. My husband and I had a short stay in the city, and it was our first time visiting. We booked this half-day tour for our first full day in the city so we could get oriented and learn more about the culture from a local. A friendly email from a coordinator greeted me after booking, and we came up with the ideal schedule and itinerary - settling upon Montmartre, Sacré-Cœur, and Notre Dame. I also requested that our guide bring tickets to the Louvre for us to purchase from him so we wouldn't have to wait in the long line at the museum the next day. We met Alex in our hotel lobby at the appointed time, and he got to know us and our interests a bit before taking out a map of Paris and sketching out what he thought would be the best way to tackle the day. From there, we were off! We stopped quickly at the Arc de Triomphe, learning about its history before taking the subway to Montmartre. Alex deftly navigated us to the Moulin Rouge and up the streets of Montmartre, pointing out nuances and interesting sights along the way. We learned about the famous street artists prevalent in this district and about the architecture of the city. He also took us to some delicious pastry shops and purchased desserts for us to try! And the bread! We stopped by a bakery in Montmartre famous for its baguettes and learned how to discern and appreciate its texture and crust. When we made it to the top of the hill, instead of just admiring the sheer size and ostentatiousness of Sacré-Cœur, we learned about the events leading up to its construction and its symbolism. We ended our tour at Notre Dame, and we were fortunate enough to witness a Christian Orthodox communion ceremony and a beautiful choir performance. We learned so much about the church and its architecture as we admired its beauty. Afterwards, Alex gave us recommendations for other places to explore in our remaining days in the city as well as when we made a return trip. This tour was so much more than we imagined and Alex is one of the best tour guides we've ever had. It was simply a treasure to walk the streets of Paris less traveled by the regular tourist crowd and take in the daily life of everyday Parisians. We learned so much and we will definitely be looking to learn more with Alex the next time we're in Paris! Great guide who personalized the whole tour on the fly as she got to know more about us and our interests. Apart from all the places we saw, she also gave us information about how to navigate transportation and find what we were looking for in Paris. This tour was the first thing we did in Paris. Thank goodness! Without it, the whole trip would have been diminished. Great! Luke was really good and very nice. We had four of us with only one day in Paris at the end of a Viking River Cruise so I arranged a seven hour tour to focus on a few areas of Paris. Since the company charges per person this was pricey. Although our guide, Marie, was very lovely and knowledgeable she arrived late, finished the tour early far away from our hotel, and left us alone for lunch. We asked for a focus on French food and wine and that didnt happen. I suspect my request form was never reviewed. Recommendations - review in detail with the guide at the beginning of the tour the exact plan so expectations can be met. The website advertises door to door service so at the end of the tour you should at least end at the subway station with ticket in hand. Having read the reviews before I booked it looks like my experience was not the norm and the company issued a partial refund since our guide was not with us the full 7 hours.